Giuseppe is an orphaned street musician from Italy who was sold by his uncle to work as a slave for an evil padrone in the U.S. But when a mysterious green violin enters his life, he begins to imagine a life of freedom. Hannah is a soft-hearted, strong-willed girl from the tenements who supports her family as a hotel maid when tragedy strikes and her father can no longer work. She learns about a hidden treasure which she knows will save her family — if only she can find it. And Frederick, the talented and intense clockmaker’s apprentice, seeking to learn the truth about his mother while trying to forget the nightmares of the orphanage where she left him. He is determined to build an automaton and enter the clockmakers’ guild — if only he can create a working head. 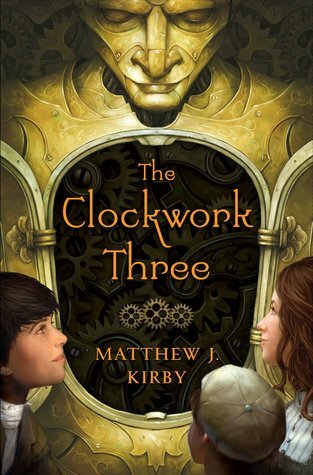 The Clockwork Three, written by Matthew Kirby, is an extraordinary novel that takes place during the late 1800’s. The story follows three extraordinary kids, each of them longing for something that is just out of their grasps. This book follows the unchanging phenomenon of how three completely different stories, people, and objects can all come together to make one unforgettable tale. The Clockwork Three is one of the most interestingly crafted books I have read by far. Not only does Kirby write in a style of modern class, combining the techniques of imagery and sense, but he also has the talent of telling three different stories at once. The children in this story, Frederick, Hannah, and Giuseppe, are as different as can be. Seeing their stories played out chapter by chapter, sentence by sentence, the flowing stream that connects their stories becomes so natural when they are all brought together.